 Based on years of experience as professional matchmakers, the Wingos present advice, backed up by case histories, for those seeking committed relationships. This upscale how-to is most effective and insightful when discussing how people undermine their own efforts to achieve long- term relationships. Among the causes of social failure are inaccurate self-perception, self-sabotage, the pursuit of fantasies, excessive self-protection, and impatience. John and Julie Wingo, married for 20 years themselves, are somewhat less successful in conveying strategies that work. 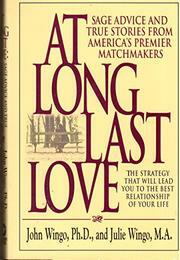 Too much of this book is an infomercial for the Wingos' pricey matchmaking service (J. Wingo International). Because clients are paying $5,000 fees, too many of the subjects of the case studies here are affluent people with the class-related idiosyncracies and years of psychotherapy to fit their incomes. A vast number of middle-class readers, therefore, will have difficulty empathizing with and learning from these subjects. The authors also impart anachronistic and chauvinistic pearls like, ``To catch a man's eye in our culture, women need to be on the thin side.'' A similar bias is projected against religion. The authors will not work with a client with a religious preference, as ``such a specification is usually connected to a kind of closed-mindedness that goes beyond religious issues.'' Not only do the Wingos ignore a proven ingredient in stable couples, but they leave out church-sponsored singles events from their list of recommended social activities. Some of the strengths here include a firm stand against early sexual encounters and a lack of the pat formulas that limit other self-help/relationship books.